Low-cost permanent attachment method for iButtons & MicroDL Data Loggers. Readily attaches to any smooth flat surface. Designed for indoor/outdoor use, U.V. resistant. Operating range: -35°C to 71°C. The DS9096P+ is made of white, double-coated acrylic VHB foam tape (3M part number 4932) which is die-cut to match the loggers. 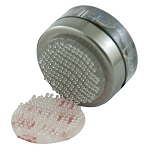 These pads allow iButtons and data loggers to be attached to virtually any smooth surface. The DS9096P+ offers excellent long-term holding power for use in many interior and exterior applications. The DS9096P+ works on most metals, sealed wood and glass, as well as many plastics, composites, and painted surfaces. Porous or fiberous materials must first be sealed to insure proper adhesion. Materials such as copper, brass, plasticized vinyl may require priming or coating to prevent interaction between adhesive and substrate. Before applying the DS9096P+, clean the surface thoroughly with a mixture of 50% isopropyl alcohol and 50% water and allow to dry. Apply firm pressure during installation to insure a strong bond. iButton is a registered trademark of Maxim. 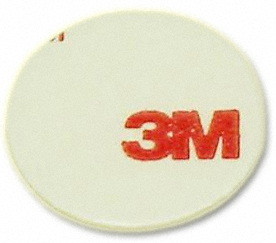 VHB is a registered trademark of 3M.